"The eleventh hour of the eleventh day of the eleventh month marks the signing of the Armistice, on 11th November 1918, to signal the end of World War One." As you may or may not know on the 11th of November here in the UK (and Commonwealth countries) is Remembrance Day which if often nicknamed Poppy Day. Such date is set aside to remember all the men and women who were killed during the two World Wars. At one time the day was known as Armistice Day and was renamed as Remembrance Day after the Second World War. 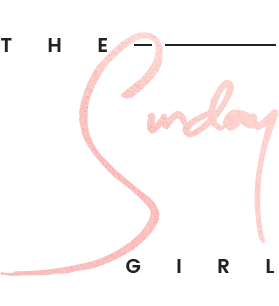 You may be wondering why we use the Poppy flower to mark such occasion? This is due to the poem "In Flanders Fields". These poppies bloomed across some of the worst battlefields of Flanders in World War I, their brilliant red colour an appropriate symbol for the blood spilled in the war. In the lead up to Remembrance Day The Royal British Legion sell artificial Poppy brooches to raise funds for the ex-service personnel of the British Armed Forces. They also provide care and support for the partners of those that serve. A very worthy and noble charity indeed. 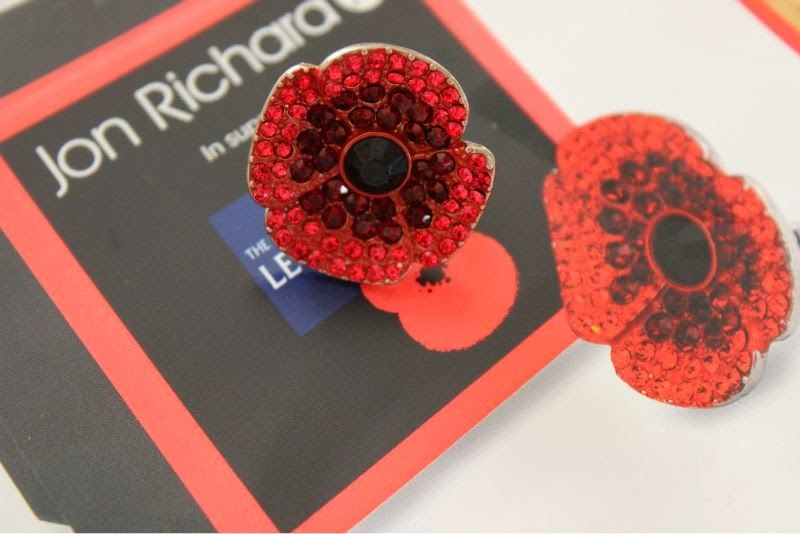 This year Jon Richard have created something a little more special in aid of the British Legion in the form of their Crystal Poppy adjustable ring. 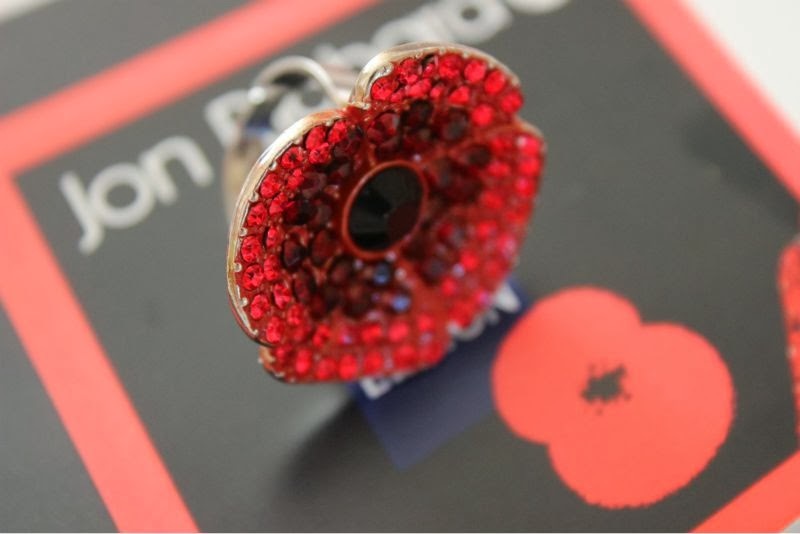 This beautiful ring is embellished with countless red crystals that truly dazzles in the light and is not only a great way to support the charity but a rather lovely piece of silver plated costume jewellery. 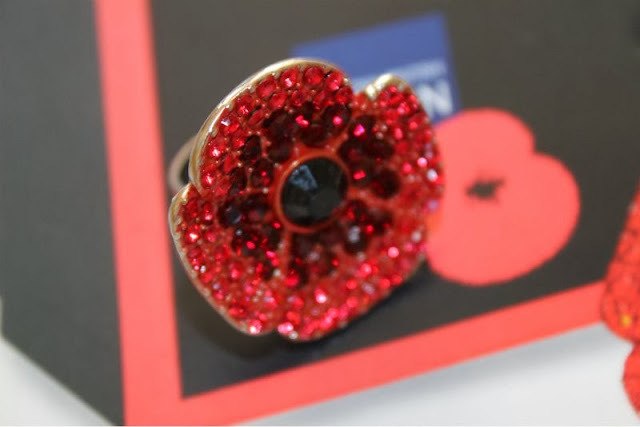 The Jon Richard British Legion Poppy* ring costs £12 and is available now directly from the jewellers site - link and can also be found in Debenhams stores. 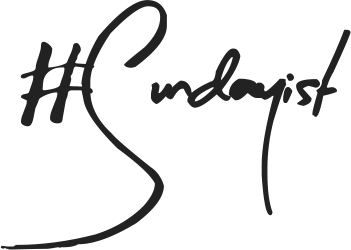 £3 from each sale will go directly to The Royal British Legion charity fund. - * PR sample but the charity donation has been donated by myself and as I do every year I will of course purchase a few paper poppies when out and about. This is great. In the US Nov 11 is called Veteran's Day and poppies are also sold to mark this day. Oh boy, I'm a poppy lover at the best of times, but these are really gorgeous and for such a good cause too. I definitely need to add one to my wishlist.